Testimony to Amity's quest for world-class education are the various prestigious national and international recognitions. Amity has been ranked India's #1 pvt. university by the very prestigious India Today survey. Amity has also received the Indian Education Award 2012 (the 2nd National Education Awards) for the best non-profit private University in India. Besides this, Amity University has been awarded the coveted 'A' rating by National Assessment & Accreditation Council (NAAC), the apex accreditation body of UGC. 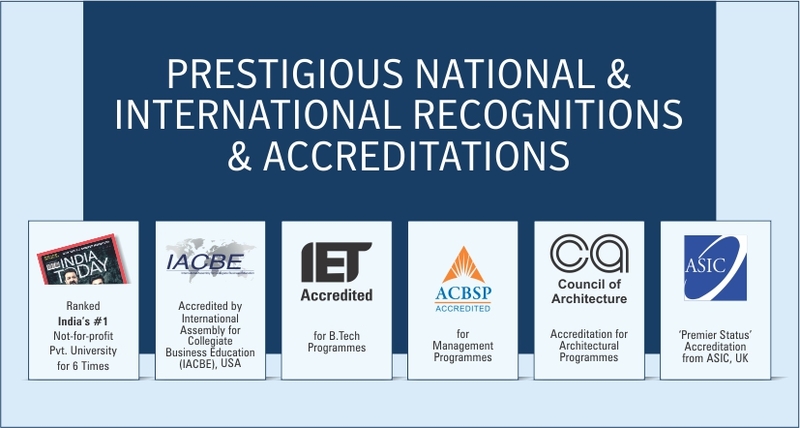 What's more, Amity is among the very few universities in the country that has received IET (UK) Accreditation for its B.Tech programmes, premier status from ASIC (UK) and ACBSP (USA) for its Management programmes.